The V-M "Collector’s Voice Newsletter" in recent years hasn’t had much space devoted to what collector’s have to say. With this issue, we’ll try to remedy that! Thanks to our new internet site www.thevoiceofmusic.com, and e-mail, I am making new friends who are sharing their V-M interests and anecdotes. Here’s a sample from Greg Ganz from Michigan. My name is Greg Ganz. I grew up with a Model 711 around the house. My dad bought it as a Christmas present for my two older brothers in 1956. I "inherited" it when they went away to college. Served me well & faithfully for many years; we also used it as the PA system in my first rock band back in 1966. I got the "nostalgia" bug earlier this year and I guess I'm on my way to a collection. I must say I'm absolutely blown away by the quality of construction and engineering. Nobody builds gear like that today. I was very fortunate in finding a model 722; it was very well taken care of. It looks almost new. It came as a set with the 168 amp in the "twin" case. It's just too cool…. My collection continues to grow. I'm expecting a Model 1471 to arrive any day now. I forgot to mention in my first note that in addition to building the best audio equipment around, the V-M Corporation employed some very pleasant and thoughtful people. This would have been around 1964; I think I was ten or eleven years old at the time. Somehow the screw for the left spindle on our Model 711 "went missing" (I was notorious for taking stuff apart); I wrote to V-M inquiring as to the cost of a replacement. Some very nice person put one in an envelope and mailed it to me at no charge. I wrote a second time inquiring about the cost of a new owners manual; a few days later one arrived along with a note thanking me for my interest in V-M products. I wrote a third time asking the price of a Phono Adapter Plug (one of the accessories listed in the manual). Again I received a pleasant note thanking me for my "order"; the price would be ninety-five cents including postage. I mailed in my dollar & they sent me the plug. I wrote a fourth time asking if it would harm the transport mechanism if the machine were run standing on end; received a detailed note explaining exactly why I shouldn't do this. I remember that my father advised me to send a "thank-you" letter, and my mother said I should "stop pestering those nice people". Nice people is right; people with a heart who must have taken a great deal of pride in their work & their company. Exciting news! Timothy C. Fabrizio and George F Paul are putting together a book of photographs that will be called "Phonographs with Flair". Available around March of 2001, this book will contain V-M phonographs and advertising items from my collection and from other collectors who read this publication! The large format book will contain some 300 photographs selected on the basis of design/style aesthetics. On that basis, you can be sure that V-M will be well represented, as we all know that V-M was a styling leader! The book will be available at Barnes & Noble, Borders, Amazon.com and other retailers. V-MCV: How did you get started at V-M? Mr. Canfield: I spent 18 years after college in the band instrument business with Conn down in Elkhart, Indianna. During World War II, we went into aircraft instrument manufacture and bought a lot of die castings from New Products Corporation. So I got to know them. For reasons I won’t go into, I was looking to leave Conn - and began looking around. I mentioned it to the New Products people and as a result of some discussions I was steered to V-M and began working there in the spring of 1947. 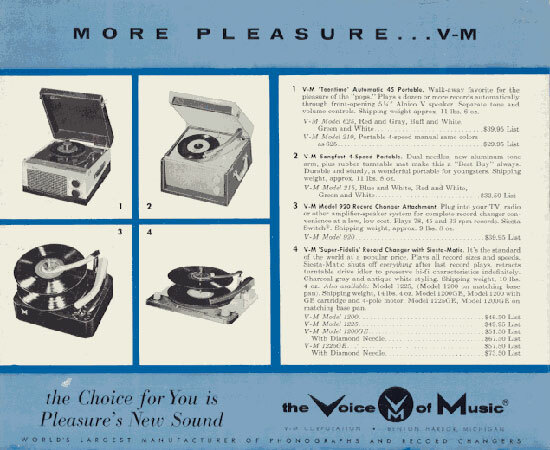 V-M hadn’t been going that long - actually at first, the record changers were made at New Products. Don Morrison was the designer, the idea man. He got a contract on a royalty basis with Walter Miller and eventually became a rich man. Walter decided to split the changer business off from New Products and he called the new company V-M. If anyone ever asked him what V-M stood for, he always replied "Virgin Mary". But actually of course, I always assumed that it was named for Victor Miller. Victor Miller was not there at that time. After the war, he finished up at Purdue University and went with General Electric, first in Pittsfield, Massachusetts, and then at their custom plastic molding plant down in Decatur, Illinois. I should also mention that Walter also started Modern Plastics. So he had four companies - New Products, Modern Plastics, and V-M. He also started Plastic Masters a few years later down in New Buffalo, Michigan. When I went to V-M there were several people who had started the changer business at New Products and had come over to V-M. Howard Edwards, Earl Rush, Bill Pape, Helen Weir (Wozniak), Ed Retzke, and Paul Kruggel come to mind. It was a small company that owed everyone - eventually became prosperous, went downhill, and when I left, owed everyone again! So it made a complete cycle. In the spring of 1947, the people that ran V-M were Earl Rush and Howard Edwards. Walter was fairly active, and would drop by once a week to talk to people about how it was going. In my opinion the biggest contribution that Walter Miller made to V-M’s success was keeping Earl Rush in sales and Howard Edwards to run the plant. Earl was a typical salesman - flamboyant, with a lot of ability. Here’s an Earl Rush story. I was in Ed Retzke’s office in a meeting one time. Earl Rush was in his office next door. There was a glass partition between the two offices. Earl was on the phone selling something to someone, and all of a sudden we heard a big crash. Earl had leaned back in his chair with his feet up on the desk and the castors on his chair had turned and slipped out from under him and he landed on his hind end on the floor. We looked over the window and he was laying on the floor still selling like crazy on the phone. That’s the kind of a guy he was. Howard Edwards on the other hand, was the ultra conservative financial man, and one of the best bosses I ever had. I always had great respect for both of them. Walter Miller’s greatest contribution during that period was keeping those two men on a par. If one would get a little stronger, Walter would put him back in his place. V-MCV: You were in engineering when you started but then somehow got into personnel? Mr. Canfield: We had a pretty good personnel man, but he was nearing retirement and coping with an upcoming union organizing campaign (sometime in the 1950’s) was just not his cup of tea. They needed a personnel director and they tapped me to do that. I knew nothing about personnel; my background was in engineering. So I asked Howard Edwards - why me? Howard said, "Well we had a decision to make. We either go outside and find someone who knows personnel but doesn’t know the Company or its philosophy, or someone from inside the Company that did know the Company but didn’t know anything about personnel." So I found myself with personnel for a few years. I had good help in preparing for the union vote, and ultimately, V-M employees chose not to be represented. Victor Miller comments: "We did our best to provide our employees with factual information on the issues. With an understanding of the highly competitive markets we were serving, they made the decision to place their confidence in our combined efforts without union involvement. That spirit of understanding and cooperation ushered in the years of greatest accomplishment in V-M’s history, and held the organization together for years even after the competitive forces became overwhelming." V-M later brought George Armstrong on board. He came after Walter died. He was put in over me in the personnel department. For awhile I reported to him and he reported to Howard. George Armstrong was the best boss I ever had. He handled me in a way that got the most out of me of any boss that I ever had. He didn’t handle me in the way that he handled anybody else. He had the faculty to handle people and work with people as individuals in the way to get the best out of them. Unfortunately, he became ill and died of cancer. One story about him. We were having a meeting on some product problem. I got home and began wondering if I talked too much.. George always got to work by twenty minutes to eight o’clock. So I got in early the next day. He was sitting in his office and I asked him, "George you remember that meeting yesterday,?" and he replied "Yes." I said, "I got to thinking and was wondering if I talked too much at that meeting?" and he said "Yes.". And that’s all I got out of him. I got the word, I’ll tell you! If the truth be known, I did not like personnel work. It is an inexact science. You make a decision and you don’t know if its right or wrong until the damage has been done. In engineering, you can make a sample, test it, and know where you stand. I told Howard that I didn’t want to stay in personnel. And he said ‘You be patient and I’ll get you back into engineering". And that’s what happened; we hired another personnel man who ended up staying for years. When I went back to Engineering, it was as Chief Engineer. Eventually, I became Director of Engineering after John Rankin left. I quit in Summer of 1970, Howard Edwards asked me to stay on we had some patent issues pending. He asked me to stay on part time as a consultant until those got ironed out and I said sure. It was a few months after that when I finally quit completely. V-MCV: Great people stories! Any others before we wrap up this conversation? Mr. Canfield: Since Fred Born suggested that you talk to me, let me give you a little anecdote about Fred. He had an office right on the front of the building. He had a window that looked right out on the street. The service truck that serviced the soft drink machines at the plant was parked in front. The service truck guy was in servicing in the plant, and Fred saw someone get in the truck and start to rob it. He called the police and they came. The newspaper put it in the paper that evening that Mr. Born saw the thief and could identify him. Fred came in the next day and said "That’s a heck of a thing to print! That guy will read that I can recognize him and shoot me if he finds me!". I said, "Why do you tell me about it - I don’t run the newspaper.". So he called Stanley Banyon - the editor of the newspaper. Stanley said, "I’ll tell you Mr. Born what we will do. If he comes back and shoots you ,we’ll give you the best funeral this town ever saw!". Fred reported: "Thats all the satisfaction I could get!". Fred was great fun to work with and did a great job - I always had a lot of respect for Fred. Thank you for sharing your memories! As you can see, Bailey remembers the people that he worked with very well. He may not have enjoyed personnel work, but I’ll bet that he was very good at it!